A French priest has taken his own life in his church after being accused of sexual misconduct, officials say. Pierre-Yves Fumery hanged himself in his presbytery in the central town of Gien, Catholic authorities said. Last week he was questioned by police, but not charged, following allegations of sexual assault involving a child under 15, news agency AFP said. Father Fumery, 38, was the second French priest in a month to take his own life after similar abuse claims. "It is a moment of suffering and a tragic ordeal," Orléans Bishop Jacques Blaquart told the media. 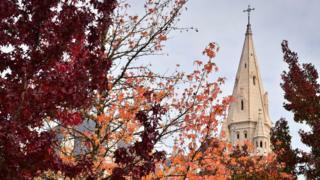 He said some of Father Fumery's parishioners had complained about alleged "inappropriate behaviour" towards children aged 13-15. One example Bishop Blaquart mentioned was of a girl "that he took into his arms and drove home several times". The diocese did not feel the claims merited being reported to the police, but asked Father Fumery to take a leave of absence. He had returned from his break on 8 October, but had not yet resumed his duties, the bishop said. Born in Orléans, Father Fumery was ordained a priest in 2014 after studying law. He joined the Gien parish at the end of 2017. In a separate incident on 19 September, Jean-Baptiste Sebe, also 38, hanged himself in his church in Rouen. A woman had accused him of indecent behaviour and of sexually assaulting her adult daughter, but at the time of his death, no formal complaint had been made.